To the Editor—Truth in science is established through open debate in an independent process. The scientific process fails when one side of a debate sets the rules, controls the arena, and ensures that its viewpoint prevails. Sadly, this is what the Infectious Diseases Society of America (IDSA) has done in the “vindication” of its beleaguered 2006 Lyme disease guidelines described in the final report of the Lyme Disease Review Panel . The letter makes the point that the process was run by the IDSA, that the panel was selected by the IDSA (7 of 8 were members of the IDSA), that the chair of the panel was a past president of the IDSA. Hence, the process was anything but “independent”. Imagine a jury trial where the defendant selects a jury of friends. The letter concludes that the role of a medical society is not to “call the science” according to the vote of a biased panel that represents one side of the debate and whose guidelines are under attack. This latter represents a clear cut organizational conflict of interest. You can dress it up any way you want to. 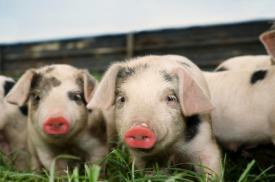 It’s just lipstick on a pig. Johnson, L. and R.B. Stricker, Final report of the Lyme disease review panel of the infectious diseases society of america: a pyrrhic victory? Clin Infect Dis, 2010. 51(9): p. 1108-9; author reply 1109-1. You can follow additional comments on Lyme policy at www.lymepolicywonk.org. You can contact Lorraine Johnson, JD, MBA at lbjohnson@lymedisease.org. Thank you for fighting the good fight. As a family of four who have all tanked with Lyme (one from Maine, one from Cape Cod in 1976, and two children with congenital Lyme), we are really tired of having not only to fight to get better but even to get our disease recognized by most doctors, insurance, family, friends, schools, etc. We are now permanently uninsurable thanks to having Lyme, and the IDSA self-righteously clings to its story, making our lives just that extra bit more difficult. An(other) expose is in order pointing out that the more narrowly Lyme is defined the easier it will be to create and promote a vaccine that successfully treats or cures the defined disease. Sigh. Thank you for everything you do to help us. Terrific. I am amazed that they printed it. Thank you for writing this letter. same old idsa blind as a bat. They couldnt diagnose a red barn if they were 10 feet in front of it. Look at some of those panel members. I remember one of them telling a child she didnt have lyme and when the mother asked for her files they lost them because she had lyme through another test from a different doctor. only looking to save there own butts. Good work, Lorraine and Ray. Keep bringing the truth up into the light. Now that Blumenthal is Senator Elect, I am hopeful that he will pursue congressional hearings on the corrupt IDSA. This arrogant bunch is responsible for the public health disaster that is Lyme Disease. Perhaps U.S. Attorney General Eric Holder can be persuaded to file suit as well. The truth, of course, will eventually prevail. I can only guess that the IDSA worms are hoping it doesn't happen for a couple of decades. We need to keep the pressure on so it happens SOON. Yes, but to the general public the lipstick looks pretty good and we look like we are whining over getting what we asked for. Unless the whole lie is exposed one day, this preception may hold up for some time. The IDSA is still winning the propaganda battle, despite the ludicrousness of their argument. Thx for the great work. Am wondering whether the letter could be downloadable for any of us to bring to our doctors.